Maintain normal cholesterol levels with the assistance of Red Sterol Complex. Combining red yeast rice, an ancient fermented rice recipe widely eaten in China, alongside plant sterols and cinnamon bark, this potent nutritional supplement supports healthy blood lipid levels for healthy cholesterol. We’ve even added vitamin E into this unique formulation for an extra boost of powerful boost of heart-friendly antioxidants and to protect against harmful oxidisation. 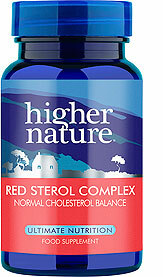 Carefully balanced for maximum efficacy, take Red Sterol Complex to help support your cholesterol. May cause a temporary, harmless red colouring of the stool. Not to be taken if pregnant or breastfeeding, nor to be taken by children. 200mg Red Yeast Rice, 1000mg Plant sterols, 34mg Cinnamon bark extract 30:1 (equivalent to 1000mg Cinammon bark), 100mg Vitamin E.
Take 2 tablets twice a day after meals for 12 weeks, thereafter one tablet twice a day. May cause a temporary, harmless red colouring of the stool. Not to be taken by children or if pregnant or breastfeeding. The total dietary intake (from food and supplements) of phytosterols should not exceed 3g a day. Patients on cholesterol-reducing medication should only consume this product under medical supervision. I am diabetic and the docs kept asking me to take statins to reduce my cholesterol levels which I didn't want to do. My reading in January was 6.7. I have been taking 2 tablets per day since then, and my reading in September is now 4.5. Nurse said, oh the statins are working, and I replied no, I'm taking a sterol tablet from Higher Nature. She was amazed at the improvement so I intend to continue.. I'm a 43 year old Mum of 2 children and had a higher than normal cholesterol, despite being very petite, exercising regularly and always following a good diet - period. 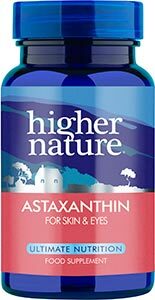 I have used Higher Nature products for over 20 years; it was assumed I had inherited my Father's genes regarding my higher cholesterol - he's been on statins for as long as I can remember. I knew Higher Nature would have the answer. This sounds untrue but 3 weeks ago my result was 6.4. 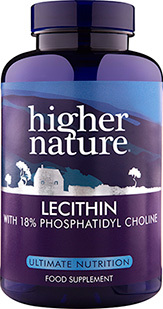 I religiously took the highest dose of this product, plus a benecol drink daily & a bowl of porridge (as an Endocrine Nurse asked me to have a repeat test). After this short period of time, my result this week is 4.6!! I cannot believe it and nor can my Nurse! THIS PRODUCT WORKS 100%! I have managed to reduce my blood cholesterol level down to 4.9 after using these for 2-3 months. It had previously been around the 5.1/5.2 level. If you have high cholesterol in the family forget about statins, combine these great tablets with high strength red rice yeast, cod liver oil and high strength garlic. Just heard from my doctor today that my cholesterol is down from 6.4 last year to 4.3. I have a really good diet so the only thing I changed was drinking dairy free benecol , fasting for two days a week on 500 calls and taking red sterol tablets - dont know which has worked or if its a combination of them all but I'm not stopping any of them !!! My overall cholesterol was 4.2 and taking Red Sterol Complex reduced it to 3.7 which is quite an effective reduction. Definitely a product that works. Thank you for an effective product. I have been off statins, which caused me some problems, for a while now and am taking Red Sterol Complex. I recently had a cholesterol test and my level is fine - no further action required! So thank you for an effective product. Cholesterol is a type of fat or lipid found in all cells in the body. It forms part of the cell’s outer layer and is transported around the body in blood attached to a protein. Your heart beats around 70 times a minute, non-stop for around 80 years or more, pumping more than 10 million litres of blood around 100,000km of blood vessels every year.